When my husband and I were first married almost ten years ago, my Grammy made me a bunch of lovely crochet doilies. There have been some pretty tutorials lately for doily table runners, doily lamps, and doily buntings, but I'm not sure I have quite enough to complete a project like that. Instead, I thought I would take a couple of my doilies that haven't been used yet and display them in embroidery hoops with a bit of colored fabric for contrast. For this project all you need is a doily (or two or three), an embroidery hoop, enough fabric to stretch in the hoop, a needle and some thread, and scissors. 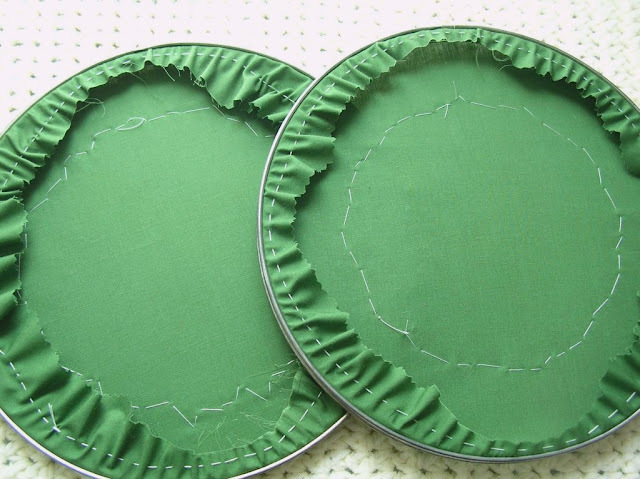 I purchased these vintage metal hoops on Etsy, and I had just enough green fabric on hand to fit in the hoops. 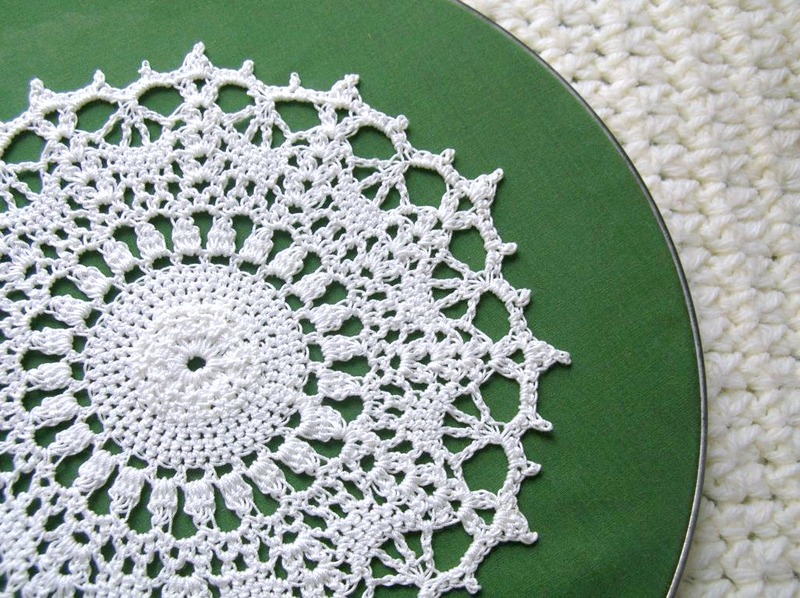 To create your own doily wall art, simply stretch the fabric in the hoop, tack down the doily with matching thread, and secure the piece in the hoop. I wanted to finish the back of the hoops in such a way that I could remove the fabric for cleaning. My friend Sasha from What. No mints? 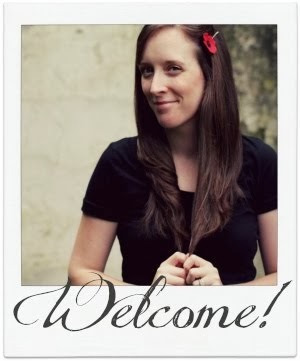 shared a tutorial with me for gathering or cinching the fabric in the back. Keep in mind that this fabric was a scrap, so there wasn't much fabric to gather in some spots but I made it work. It certainly isn't pretty on the back side though! 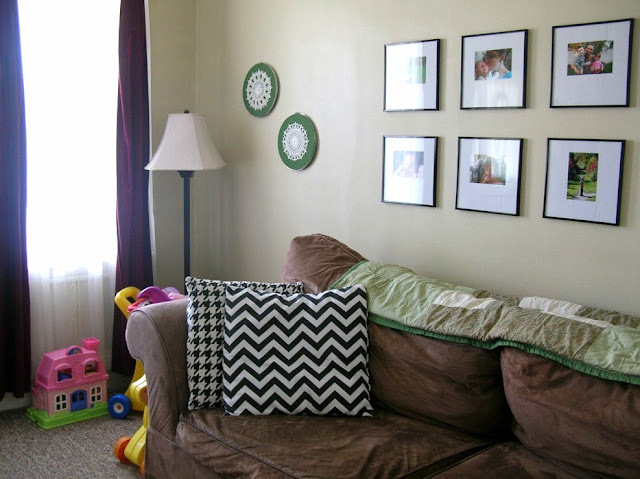 I think the hoops add a sweet touch to our tiny living room, and the pop of color on the wall is perfect. They are definitely making me smile. Now we just need to get that second coat of paint up on the wall to get rid of that wonky color look! Soo cute! What a great idea. Love it! Digging in the linen closet for doilies! 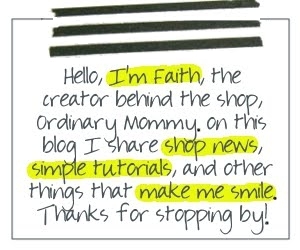 saw you on craft gossip! awsome idea! I just received several beautiful dollies that my husbands great grandmother made. This is such a beautiful way to display them! 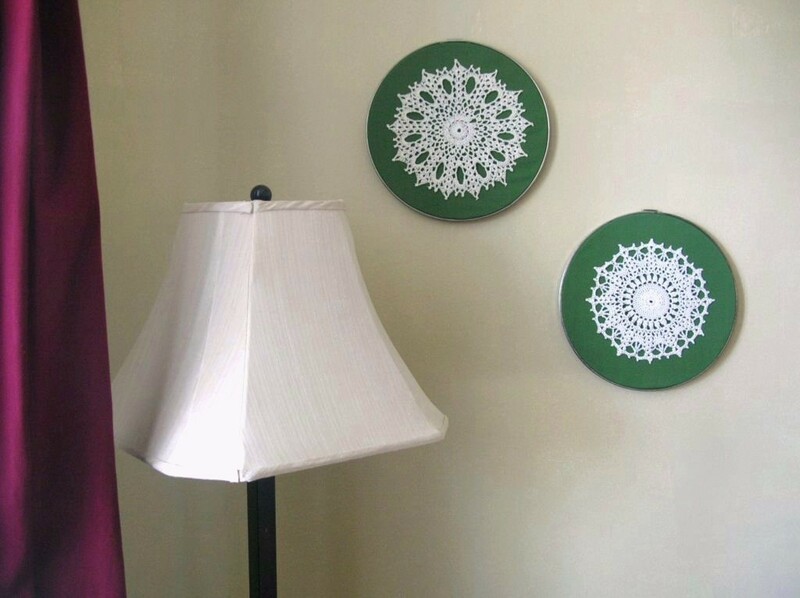 Beautiful doilies...but I do believe several are displayed with the wrong side out. Thanks, Linda! I'll double check. very pretty! 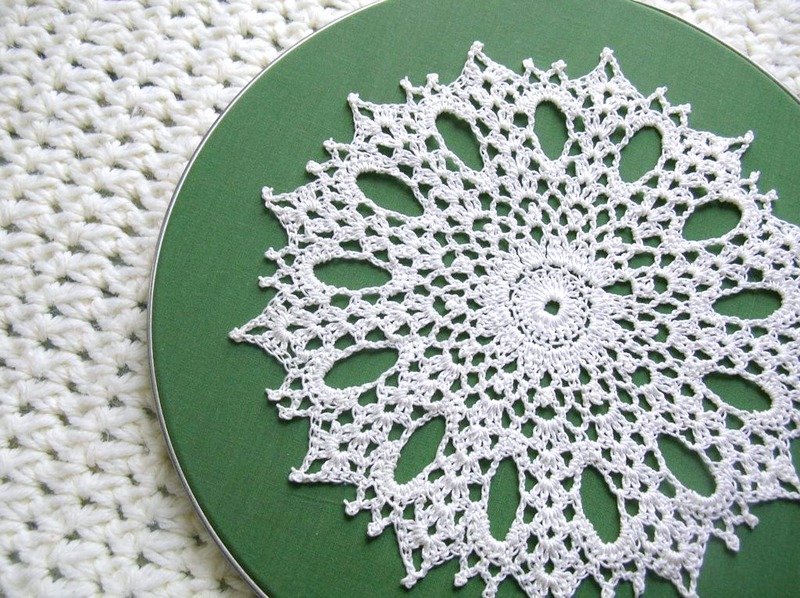 I love doilies! Love the doily-in-hoop displays. Even I can do this. 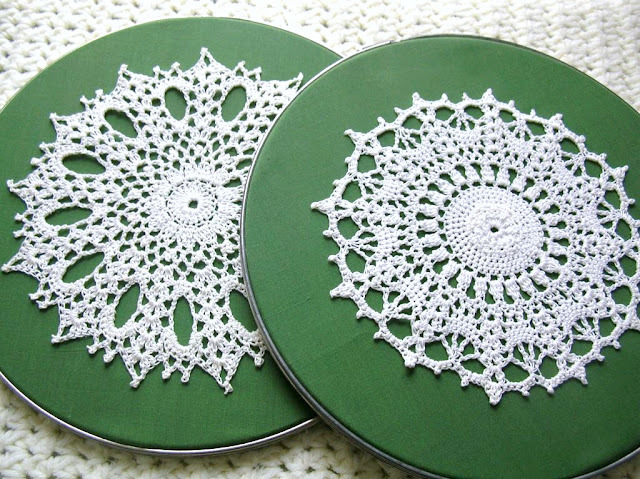 I love to make little doilies and don't know what to do with them other than say "Here are some coasters for you." They DO make pretty coasters. I loves the doilies in hoops -- even I can do this. I love to make little doilies but have been using them for coasters.